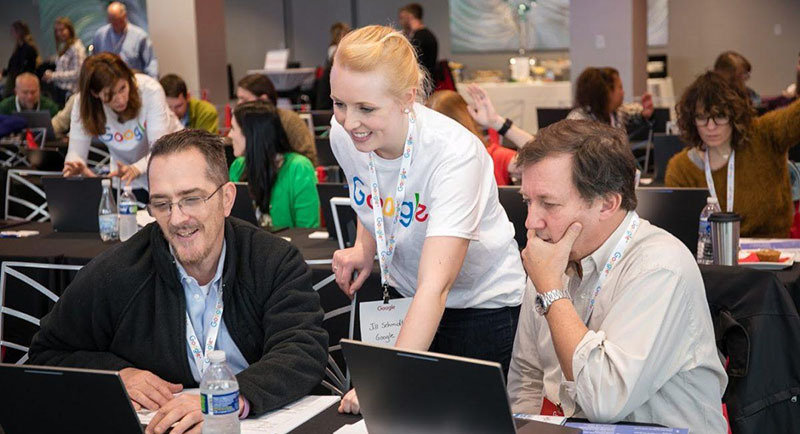 Through a generous grant from Google, as announced on April 2nd, COABE is proud to share that we will be holding Google Boot Camps for Applied Digital Skills in every state over the next year. Applied Digital Skills is Google's free, video-based curriculum for teaching digital literacy skills -- everything from creating a resume to using spreadsheets to create budgets. This training will be offered free of charge to you and can be included as an "add-on" to your state conference. Please register or contact sharonbonney@coabe.org for more details. Also, when you sign up your state to participate in these free boot camps, we will gladly provide your state with free advertising to members in your region! Our leadership can also Zoom in to deliver a keynote and/or to meet with your board of directors upon request. We are accepting applications for Google certified trainers to lead our boot camps. Have you already been using Google Applied Digital Skills? Share your success story and the opportunity to win one of our prizes! You and your staff and/or state members can complete this short survey for the chance to win a $500 certificate toward COABE 2020 in Baltimore, Maryland on April 4-6, 2020. $156,000,000 in proposed funding cuts. 100+ new legislators in the house of representatives. These two reasons alone are indicators that we cannot be silent. We must take action for adult education. Join COABE in Washington D.C. on May 6 & 7 for our 6th annual Capitol Hill Day. Details are below. COABE and NASDAE recently sent a survey to the field to determine top legislative priorities. There were just over 200 responses, so we will continue to keep the survey open through the coming weeks. Please push this out to your members and constituents. We have also organized targeted calls with state leaders to ensure we are effectively reaching legislators in decision-making positions on committees. Spring Capitol Hill Day will take place on May 7th in Washington, D.C. Please join us in D.C. during this very important time as we raise our voices with 100+ new legislative leaders and their staff. Contact advocacy@coabe.org for details. COABE and NASDAE partner to provide solid national and state level data which will be used when we meet with legislators in person, and also on our joint Educate and Elevate campaign pages HERE. Click HERE to view our template which will be customized per stated. COABE sends bimonthly "Talking Points" to legislators. Review the fast facts that are shared. COABE can customize a state-level campaign for your state and give a presentation on the award-winning Educate and Elevate campaign at your conference. Contact sharonbonney@coabe.org for details. A legislative session was held at the COABE conference for state leaders, led by our national public policy firm, Capitol Hill Partners. While attendance was dismal, the topic was indeed very timely. Listen to the recording. Leadership from COABE and SkillsUSA meet to discuss partnership at SkillsUSA headquarters. Last year COABE and NASDAE leadership met with the executive director for the Chamber of Commerce Foundation. That meeting led to an invitation to attend the Talent Forward Conference which brings together business leaders from all over the country. That conference then led to partnerships with Amazon, Google, and National Association for Workforce Professional Developers. COABE is also partnering with Tyson Foods, NAPA Auto Parts, and the Marriott. As well, COABE is partnering with SkillsUSA, a career and technical organization that serves nearly 400,000 high school and adult learners nationwide. Representatives from all of these partners attended the COABE conference in New Orleans, LA where they had a booth, and their CEO delivered a short keynote and discussed our joint initiatives. Amazon launched a new partnership with COABE which enables adult learners who get their high school equivalency to apply for jobs that they would not otherwise qualify for. Jobs start at $15-$19 per hour, plus benefits and access to the College Choice Program, which pays for 80% of the participant's college fees. Employees that have been employed for 2 years at the company and do not wish to go to college but would rather work, may bypass the usual requirement for a bachelor's degree to obtain a job in management. Amazon has offered to set up field trips for local programs. Contact sharonbonney@coabe.org for details. Thank you to all who took part in and attended the COABE 2019 national conference! Pictures and short videos have been posted to social media. Click HERE to join us on Facebook, Twitter, Instagram, and LinkedIn. We have put together a map noting the attendance by state. The top 10 states that brought in the most attendees are as follows. Thank you to all of the state directors and state association leaders who encouraged their members to attend the conference! The COABE Journal seeks to be the resource that adult educators turn to for learning and inspiration. Since the COABE Journal starting using a 'theme' format -- first with Career Pathways and most recently with Prison Literacy -- we have seen a tremendous response. Nearly 12,000 readers now download and use the Journal. We hope you will consider sharing your expertise as we begin planning for the October 2019 issue. The next edition of the COABE Journal will focus on leadership. We will be accepting manuscripts that focus on leadership at all levels including but not limited to student leadership, leadership in the classroom, teacher leadership, administrative leadership, leadership in giving, leadership in advocacy and public policy, community leadership, and more! The call for manuscripts will open on May 1, 2019, and we invite you to share your expertise and research with us!